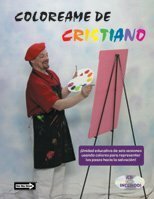 "ColorÃ©ame de Cristiano" is the "Color Me Christian" six-lesson curriculum now available in Spanish. The music CD does include songs in Spanish. Looking for an easy way to clearly explain salvation to children? This series of six lessons uses colors to explain the steps of salvation. Each lesson focuses on one color, using songs, drama, object lessons, puppet plays, and even snacks to convey the message. Join Pierre the Painter in lessons 1 to 5, each using a different color to represent a part of the plan of salvation. Lesson 6 is an overall salvation review in a "60 Minutes" format. Children will learn how to become a Christian and share their faith with others. This unit provides 60 - 90 minutes of programming for each lesson, and can be adapted to fit the needs of your ministry. Includes decorating ideas, special character scripts, object lessons, stories, scripture memory activities, prayer and spiritual challenge, snack ideas, and more. This series is geared toward grades one through six. It can be used for children's church, VBS, midweek activities, Sunday school, camps, and more!